Mozilla FireFox is a well known Internet browser its also famous because of its add-ons. 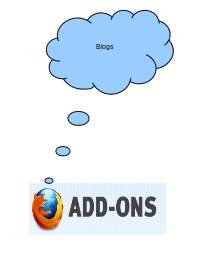 Here simple scan view of few add-ons that's helpful for bloggers. scribefire: powerful blog editor supports most of blogging platform.you can post to multiple blogs at once. screen capture elite : capture screen shot of entire window.you can also grab area to capture. AddThis: makes sharing and bookmarking simple.you can share any page any time with anyone. Deepest Sender: another simple blog editor post to your blog directly from FireFox.its also supports blogger. Feedly : its a Feed reader provides magazine type start page and seamless with google reader , twitter , Delicious and YouTube . FeedBurner Subscribers : its monitor your Rss readers and hits of your Rss feed. Fox notifier : give you real-time updates from your favorite website feeds , twitter and facebook . Blogger web comments : puts a current page comments to panel.its includes author and title display , mouse scrolling and notifier dragging . interclue : it's tells you whats behind a link before you clicked on it . its save your time from surfing and also save you from trusted sites. Zemanta : help you to find related links, images and articles and tags for your blog post. Mywords : its save common words and phrases you use while typing. Tag editor : generate tags for your blog. Insert image Lite : insert images from photobucket , flicker and imageshack in just one click.